Despite the fact that the Josh Norman-Odell Beckham Jr. matchup last season got out of hand and downright dangerous, cornerback/receiver feuds are rare and delightful, and though Washington and New York don’t play until Week 3, the Giants are doing everything they can to shade Norman and hype up the rematch. Norman, who signed for $50 million in guarantees this offseason, was barely seen on Monday night, usually lining up on the opposite side of the field from Antonio Brown, who torched the Skins. 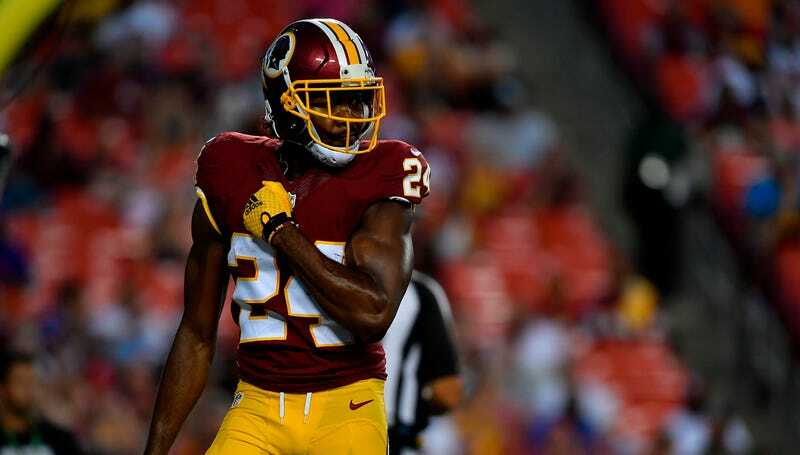 Why Didn&apos;t Josh Norman Cover Antonio Brown? After practice yesterday, Victor Cruz went after Norman for, in his words, “choosing” not to cover Brown. “Especially if he calls himself—I don’t call him this, he calls himself—the best corner in the league, then you have to cover the best receivers on the other team,” Victor Cruz said. “Going in I thought he was going to follow [Brown] all over the place, but he didn’t, so it is what it is. He made his choice. The Skins said even before the Steelers game that they wouldn’t have Norman shadowing Brown because it would be too complicated for the rest of the secondary if he constantly switched sides to match up. And indeed, Norman was almost exclusively on the left side of the field. Norman, a good soldier, said he had faith in his coaches and wasn’t brought in to question the game plan. The Giants’ expensive new corner Janoris Jenkins wasn’t buying that. Cruz said he expects that Norman will be on Beckham in Week 3, given their history. But that raises a couple other questions. If Washington’s coverage proves as inflexible as it was in Week 1, will the Giants change up their gameplan to let Beckham run wild against Bashaud Breeland? Would the Skins just let that happen again after getting roasted by Pittsburgh? And most importantly, is Cruz only goading Norman into covering Beckham so he doesn’t have to deal with the shutdown corner?